"A medal will be struck to pass down to posterity the era in which the metric system has been brought to perfection and its basic operation. The inscription engraved on the main side of the medal will be " A tous les temps, à tous les peuples " - To any time, any people. 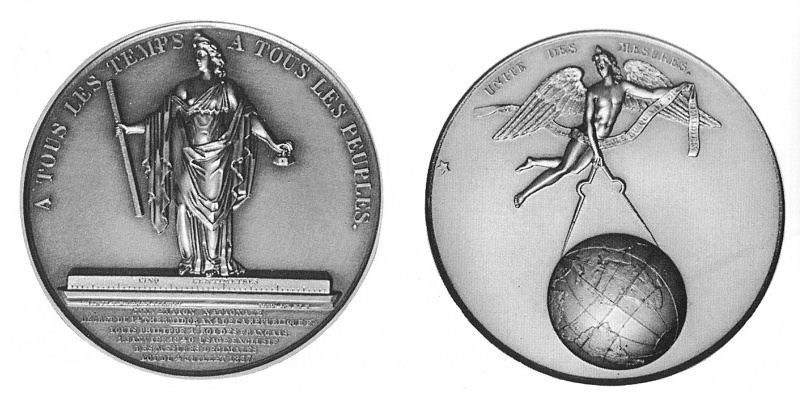 The medal will be inscribed below " République Française an VIII " - Eighth Year of the French Republic. The Republic Consuls are entrusted with settling the other accessories." However, the medal was created only after the 4 July 1837 Act was promulgated, declaring the system legal. The medal was created thanks to Gonon, a patron from Lyons who, besides, introduced changes in the original plan.